AdventureSails are about small steps. We have been told that girls are most vulnerable when they enter the 7th grade. They have moved out of grammar school. They are growing awkwardly. Their bodies are changing. It is a time of wonder and each girl should be able to experience positive wonders. But for a variety of reasons, many girls do not have a support system in the family or schools. Thankfully there are organizations such as Girls Inc., the Boys and Girls Clubs, the Girls Scouts, etc. who can help girls through this maze. In 1990 Doris Colgate, founder and CEO of Offshore Sailing School, founded the National Women’s Sailing Association “to create awareness of sailing among women and help women build confidence in their sailing skills.” At the same time, Doris was also interested in introducing sailing to at-risk girls between the ages 9 and 14. They needed positive role models and also opportunity to explore the water and sailing. In 1991, Doris established the AdventureSail program, a mentoring program for this group of girls, and introduced it across the country. The volunteer women were members of the National Women’s Sailing Association. The purpose of the program was to provide girls with positive female role models, give them an opportunity to experience teamwork, to be self-confident and embrace one’s self worth. Today, AdventureSail events are held in Massachusetts, New York, Wisconsin, Louisiana, California and most recently St. Croix, USVI. The volunteer women are no longer exclusively NWSA members, but they are all committed to sharing their love of the sport of sailing and know from personal experience how much sailing has impacted their own lives. 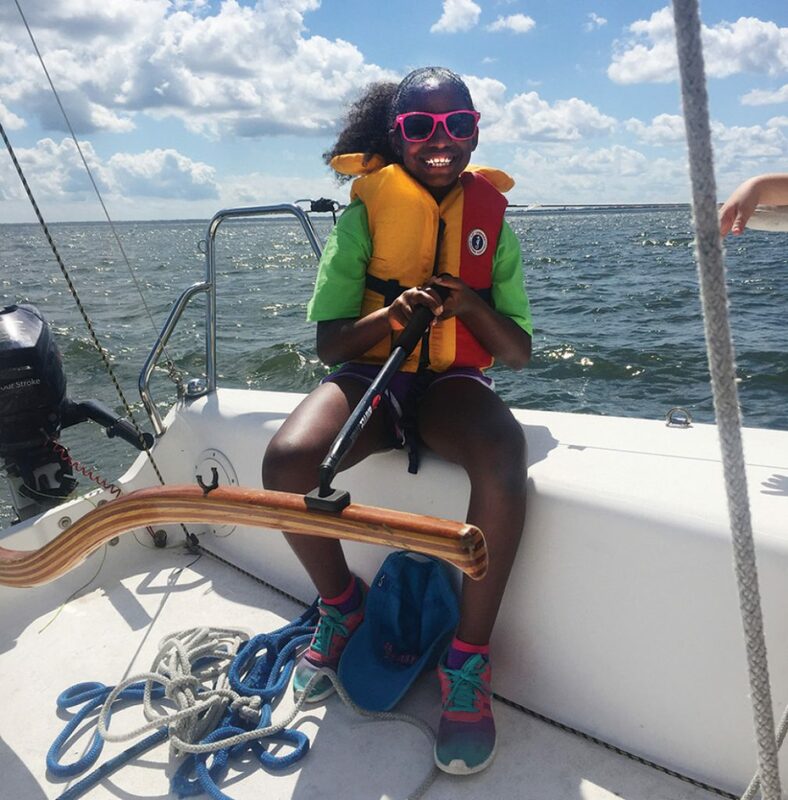 The AdventureSail program helps girls develop self-confidence, self-esteem and may steer them to making positive life choices. The program also introduces an awareness of opportunities involving marine-related sciences and the boating industry they may wish to pursue. The impact of the day these girls spend with positive female role models may not be known for years, but a seed will have been planted. 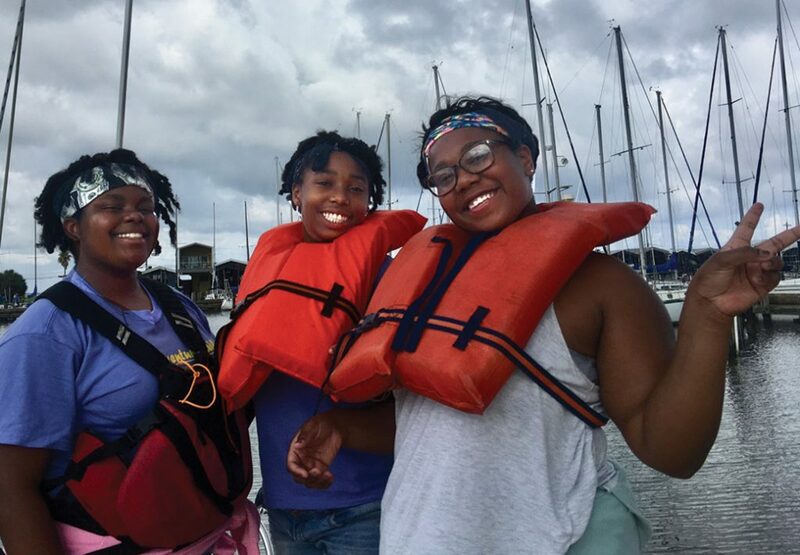 Last summer on an almost breezeless morning, a guest speaker for the New Orleans AdventureSail, meteorologist Kweilyn Murphy singled out two girls. Both were having challenges. One, a tiny girl, was already shedding alligator tears. She told the skipper she came from the hospital. Her father was in intensive care, “again.” The other a very tall girl, standing separate from the group of chattering Girl Scouts, awkwardly inspected the ground around her feet. She was painfully aware she stood apart from the group. Neither girl seemed the least bit excited about going sailing. Both were just trying to make it through an ordeal someone thought they might enjoy. “You’re the lucky two coming with us!” Kweilyn beamed as she circled behind them like a sheepdog herding them toward their boat waiting at the dock. The tall girl was asked if she wanted to drive the boat. She had to act brave for her new friend, so she quickly accepted the tiller. Kweilyn took a selfie with the girl at the helm. “Smile!” The petite girl smiled too. Then she was coaxed by the whole crew to take her turn. Suddenly, there was a much needed fun and happy boat. All smiles! Susan Epstein, a WSF board member, has volunteered annually at the Boston AdventureSail event hosted by Courageous Sailing Center. At an AdventureSail day a few years ago, Susan was showing one of the girls how to do a cleat hitch on the docks. There between the boat, a Rhodes 19, and the dock one of the girls saw something in the water and stepped back with a little shriek. The girl touched the jellyfish and immediately and quickly pulled her whole arm away. Then she timidly reached back to feel it again and asked, “Can we take him with us in the boat?” A temporary, appropriate container…a large ziploc bag…was found and filled with Boston harbor water and a small jellyfish, and a very excited young girl took it with her on the Rhodes 19. “Would you want to go home with him if he asked you to come?” asked Susan. We all find fulfillment in sharing the joy of sailing, giving a child a slice of the bliss we find in the sport. We see our young selfves in these girls. It makes us happy knowing we do this small thing, give a bit of our time, to help the girls learn about an undiscovered part of themselves and of the environment around them. AdventureSails give us such wonders. Debbie Huntsman is the President of the National Women’s Sailing Association and lives in Phoenix, AZ. Joan Thayer is a Past President and lives in Marblehead, MA. The NWSA’s Women’s Sailing Conference is June 1 at Corinthian Yacht Club in Marblehead (see page __).